Not long ago, John Doerr -- a Kleiner Perkins partner and the so-called Michael Jordan of venture capital -- was interviewed at a tech conference and asked about his firm's choice to pass on an early investment in Twitter. Doerr's forthright assessment: "We were wrong." At another point in that interview, when Doerr was asked if the Web industry was in a bubble, he said he prefers to think of bubbles as booms and that in general "booms are good." String both of those comments together and you have a quick explanation of why Kleiner Perkins led a $200 million venture investment in Twitter this week -- and in doing so, drove the startup's valuation to $3.7 billion. But now that the deal is done, one has to ask: In making this late-stage, premium-padded investment in Twitter, was Doerr wrong again? In the new world of social media, Twitter is the name most frequently mentioned after Facebook. It has proven to be a powerful branding tool for everyone from big celebrities to obscure freelancers. As a publishing platform, it has produced breaking news faster than traditional outlets. For social causes, it has helped raise awareness about and money for those in need. To be fair, Twitter got a late start in the revenue game, opting instead to first cultivate a loyal base of users -- roughly 200 million at this point -- before experimenting with how to monetize all those micro-musings. In addition, social media is still a nascent industry, with no hard-and-fast rules for making money. And Twitter projected that its revenue would soar in 2010 to $140 million (although recent independent estimates put the figure below $100 million). But Facebook was founded only two years before Twitter, and it's way ahead on revenue growth. Facebook's revenue is expected to grow to $2 billion this year from $700 million last year. Based on private stock sales on secondary exchanges, Facebook is worth $52 billion, which would put its price-to-sales ratio at a still-ethereal 26, much lower than Twitter's, but significantly higher than the 8.7 ratio of publicly traded search giant Google (GOOG). This week, Twitter also launched a series of features intended to help businesses use the service as a marketing tool, including self-serve ads and how-to tutorials. The company is using strategies that Facebook devised to make social-networking ads pay. But at the same time, its efforts underscore how Facebook and Twitter have moved into different leagues this year. Facebook is more actively searched than Twitter, according to Google Trends. In fact, it's not even close. More important, Twitter not only lags behind Facebook in the number of unique visitors in the U.S. -- the market where it's more likely to monetize its service first -- its growth in that metric is slowing down, according to ComScore. So even before Twitter has solved one major problem -- how to profit from its growing audience -- it may have to confront another -- how to keep its current users active while luring new people to the service. Some growth is likely to come from overseas markets like Indonesia, Brazil and Venezuela, but many expect its user base in emerging economies will be harder to monetize. 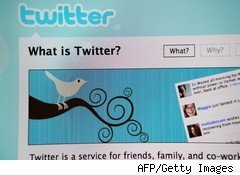 How Integral Is Twitter to Users? If it can get past those obstacles, Twitter will have an easier time seizing its opportunity to weave its way into users' daily lives the way Facebook has for many of its half a billion users. But therein lies another challenge for Twitter: Its users are older on average than those on Facebook. Many Facebook users consider that site an integral part of their everyday lives, whereas older Web users tend to regard social networking sites more as afterthoughts. In the end, the best defense of Twitter's $3.7 billion valuation is that it has a Plan B: Sell itself to an aging tech giant desperate for a social media star that can deliver hundreds of millions of active accounts overnight -- say, Google, Microsoft (MSFT) or Yahoo (YHOO). Remember that Google was willing to pay up to $6 billion for Groupon and reportedly offered as much as $4 billion for Twitter, so it's not hard to imagine Twitter holding out for a year to fetch a $6 billion price, which would double Kleiner's investment. That might make Twitter a worthwhile investment for Kleiner Perkins, but it's not the spectacular slam dunk John Doerr would have made in his prime. What would Michael Jordan say?